April 15, 2019 —Cape Town, South Africa — The Centre for Proteomic & Genomic Research (CPGR) announced that it has entered into a critical last phase of the MADCaP project, a pan-African genome-wide association study aimed at identifying genetic risk factors that underpin prostate cancer development in men of African descent. Part of the MADCaP consortium, the CPGR has taken the lead in managing the sample-in to data-out components of the project. This involved site visits, to all African collaborating centers; on-site training and capacity development at collaborating centers; development of standard operating procedures (SOPs); management of sample logistics; implementation of comprehensive sample quality control measures; processing of samples on high-density genotyping arrays; and, assisting with data analysis. The CPGR has been involved in custom designing a SNP (Single Nucleotide Polymorphism) genotyping array tailored to cancer research in African populations. To this end, CPGR worked closely with a team of international experts, in the MADCaP consortium, to optimize the array in content and performance with respect to the desired project outcomes. The consortium opted to use Axiom™ technology, on a GeneTitan® (Thermo Fisher) platform, for high throughput processing of 10,000 samples from African male patients and healthy donors. While CPGR has commenced the bulk processing of samples collected in the project, the consortium has plans to make the MADCaP array available for general use as early as the third quarter of 2019. This is in the interest of supporting oncology research in Africa. 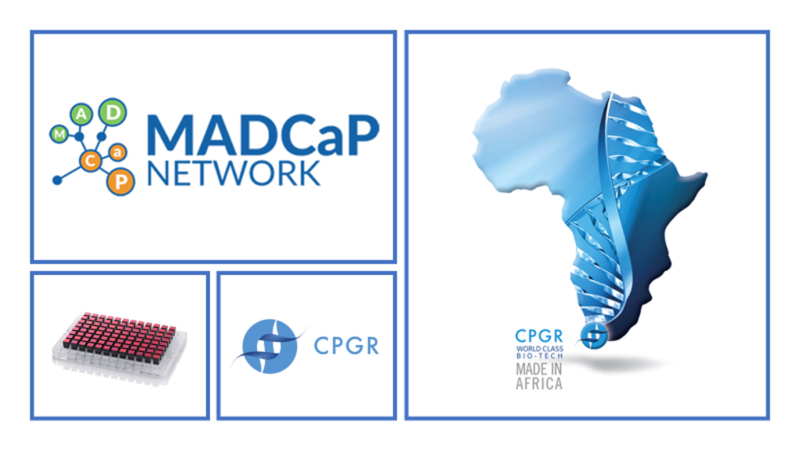 CPGR, together with the MADCaP consortium, will present an update of its progress in the project at the upcoming AORTIC conference, in Maputo, Mozambique 5-8 November. Said Dr Tim Rebbeck, Vincent L. Gregory, Jr. Professor of Cancer Prevention, Epidemiology, Harvard T.H. Chan School Of Public Health, ‘CPGR has been a key collaborator and a valuable resource for the MADCaP Network. There is no question that the scientific progress made by our network would not have been possible without CPGR’. Said Dr Lindsay Petersen, Manager for Routine Genomic applications and MACaP project manager at the CPGR, ‘having come thus far in our journey with MADCaP has left us excited. The opportunity to work with the consortium, in supporting key elements of a large-scale GWAS across four African countries, has allowed us to build foundations for working on similar projects in the future. We look forward to collaborating with the MADCaP consortium as well as many African scientists with a strong interest in cancer Genomics’. The CPGR is a non-profit company located in Cape Town, South Africa, based on an initiative by the Department of Science and Technology (DST), and financially supported by the Technology Innovation Agency (TIA). The CPGR combines state-of-the-art information-rich genomic and proteomic (‘omics’) technologies with bio-computational pipelines to render services and support projects in the life science and biomedical arena in (South) Africa, all run in an ISO 9001:2015 certified and ISO 17025 compliant quality management system. Among others, the CPGR has recently launched an accelerator program to stimulate the creation of South African start-ups based on ‘omics’ technologies and set up Artisan Biomed to develop and implement Precision Medicine solutions in (South) Africa. The organization uses the open-source Baobab LIMS for sample and data tracking; and, it has recently implemented a DRAGEN platform to enhance the development and execution of high-speed/high-volume NGS data-sets. CPGR also hosts DIPLOMICS, a large infrastructure program initiated by the DST. In December 2017, CPGR entered into a partnership with the Sunflower Fund to enhance stem cell donor typing in Africa. In support of Genomics capacity development in Africa, CPGR has launched an iScan system for high-end genotyping studies in early 2018. In April 2018, CPGR announced a new partnership to form a bespoke African biotech incubator, OneBio. The Centre for Proteomic and Genomic Research (CPGR) is one of Africa’s first fully integrated ‘omics’ service providers, built to leapfrog South Africa’s ability to conduct information-rich biomedical research onto a globally competitive level. Amongst others, the organization offers the following ‘omics’ capacity: Next-Generation Sequencing: NextSeq500 (2x), MiSeq (1x), MiniSeq (1x), IonTorrent PGM (2x), IonProton (1x), for sequencing projects; Microarrays: Affymetrix GS 3000 (1x) and Affymetrix GeneTitan (1x) for genotyping and gene-expression analysis, Illumina iScan (1x) for high throughput genotypiong; Mass spectrometry: Thermo Q Exactive, SCIEX API4000 triple quadrupole and ABI 4800 MALDI-ToF/ToF for MS-Proteomics; High-throughput PCR: QuantStudio 12K Flex Real-Time PCR System, QuantStudio 3D Digital PCR System, and ABI 7900 for qRT-PCR and genotyping applications; Automated DNA/RNA QC, library handling and sample processing; dedicated IT infrastructure and bioinformatic applications for data analysis and interpretation. Information about the CPGR can be obtained at www.cpgr.org.za and www.cpgr.org.za/blogspot.